Sometimes a guy just has to make things. Get his hands dirty, bust out those tools he's had in the basement for years and actually build something from scratch. The trick is, for the casual DIY dude - you don't want something that is impossibly hard and is going to turn out looking ridiculous. Ideally, you'll find a DIY project that has a certain amount of function to it and looks pretty cool when you're done. Here's our list of cool DIY projects for men from around the web, including links to the full tutorial where possible. Simple, yet sturdy, is this open-style wooden tool box. If you're visual and need to see what you have for your project, this is just the tool box for you. You can locate the instructions on the Art of Manliness site here. Ron, who used to tell people the only way to get their kids to practice the guitar at home was to put the guitar out where the kid can see it, decided to have a similar approach to the tools he owns. He puts everything out where he can see it. Check out how Ron makes it by checking out instructions. If you have basic wood-working skills, you can make what the person who posted on Instuctables says is easy, comfy, adjustable and sturdy chair. See the instructions here. Trisha saw this lamp idea and decided to make this for her nephew, who is a big baseball fan. This is a great project idea for father and son. Check out how to make it here. DIY Joy has this great idea for a fire pit- it uses up-cycled tire rims and this pit doesn't take up too much space, yet is plenty big enough to keep you warm. Check out the tutorial here. Man Made DIY has a great idea for your next weekend project. Get the bikes out of the way by hanging them up. See how to do that here. Cate and Tammy put their husbands to work on this awesome new mudroom for the garage. Check out how to build this. Fabulously Frugal gives a great solution for the awkwardly shaped yard tools that you have. Why not try to make this for yourself? Check out the instructions here. Mini Manor discusses how the garage is mainly her man Lee's domain, but she gets one corner for her gardening. Check out how to make this adorable, organized space in your own garage. Haydee was asked to write about how she turned something ordinary into storage for her garage. She took this old filing cabinet, turned it on it's side, and made this amazing functional garage storage! 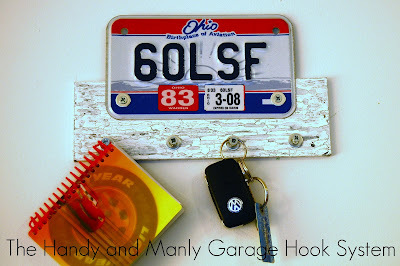 When the organization bug sets in, Mandy gets to work on these storage solutions for her garage. Check out the instructions for how to do this here. You'll find that these storage towers will be a winner in your garage. They're not too hard to make and Katie gives you full instructions here. 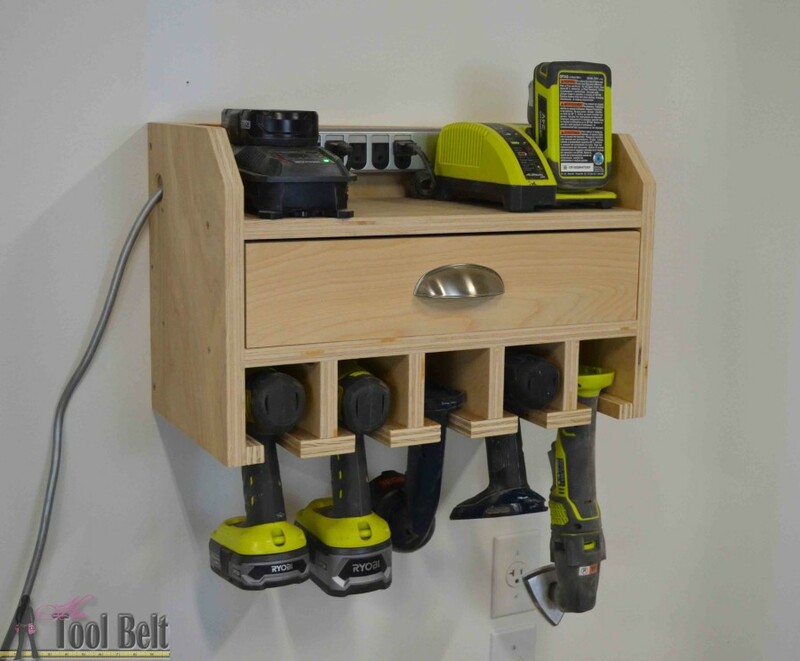 This would be a good way for you to get your cordless drills charged and keep them organized and all in one place. Amy gives full instructions here. Jamison and his wife Jamie take DIY to a whole new level. They created this cool lumber rack, but even better, it's portable. See how they did it by reading their instructions. According to Home-Dzine, you can turn an old door into your very own work table, and it's foldable. Check out how to make this. Jamison makes building this look easy, but you probably want to have a little experience before trying to make this golf locker. See his plans and instructions here. This guy from American Woodworker Editors has several types of tape in his garage and wanted a nice, organized way to dispense them. How cool! Check out the tutorial! Shanty2chic turned a nasty garage into a place where you would want to chill! Why not try this yourself on your own garage? Check out how to do it here. Matt thinks that this stool looks way better than the old "grandpa-style" camping stools from way back in the day. You could take this and make it quickly and easily if you follow his instructions. Tiffany thought forever about what kind of manly gift she could give her friend, and finally came up with this cool manly key hanger. She shows you how to make it here. Bees and Roses put some old cinder blocks to use by making the coolest bench. Some suggest painting the concrete, but how awesome would this be for your weekend project, gentlemen? Check out how to make it. The Whoot - Do you have someone in your family who is a bookworm? Why not build them a chair that meets every need? Check out to build this cool chair here.